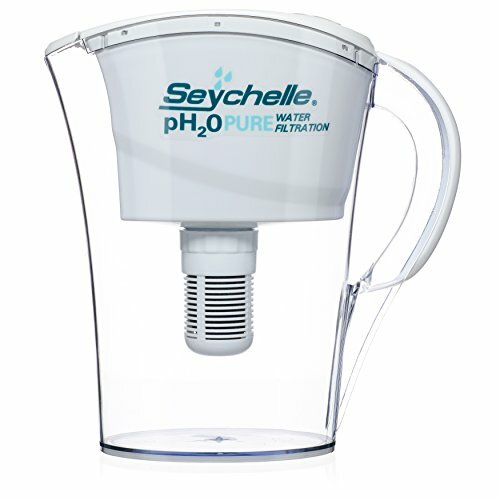 This Seychelle Alkaline Filter Pitcher provides up to 100 gallons of great-tasting, high-quality pH water. The filter naturally alkalizes your drinking water to support your bodies delicate pH balance. Seychelle’s proprietary blend of adsorption media naturally creates, pure, great-tasting alkaline water, removes harmful contaminants, while protecting beneficial trace minerals to improve your health and wellness. Use with chlorinated or disinfected water supply only and not intended for use with private wells, rivers, streams or salt water. THE ORIGINAL ALKALINE FILTER PITCHER. Seychelle was among the first alkaline filter pitchers and has been the most trusted name in water filtration for 20 years. MADE IN USA. TESTED IN USA. Beware of competitors with untested filters manufactured overseas. ENHANCES pH UP TO 9.5, providing healthier, more alkaline water around the clock for the whole family. FILTERS ORGANIC AND INORGANIC CONTAMINANTS. Most alkaline products fail to remove a primary source of acidity: acidic contaminants. Seychelle Alkaline Filter Pitcher is tested to remove heavy metals and pollutants found in tap water: benzene, MTBEs, VOCs, THMs, chloroform, mercury, arsenic. BETTER DESIGN for easy fridge-fit, 4-cup capacity, hassle-free lid fill.